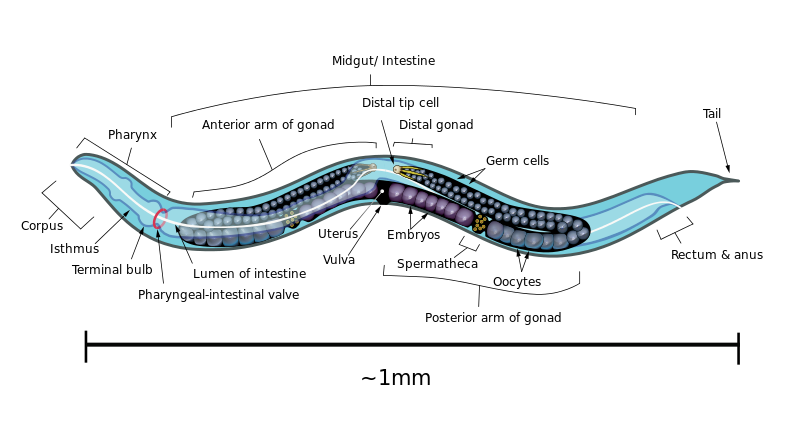 Caenorhabditis Elegans (C. Elegans) is a nematode and a member of the phylum Nematoda. C. Elegans are roundworms and threadworms that are smooth-skinned, unsegmented worms with a long cylindrical body shape tapered at the ends. They are non-hazardous, non-infectious and live in the soil. The worms are often found in soil near rotting vegetation, feeding on microbes such as bacteria. Scientists often study C. Elegans because they are about as primitive an organism that exists which shares many of the essential biological characteristics that are central problems in human biology. The worms have a nervous system with a brain and exhibit behavior that is capable of rudimentary learning. Maximum length is about 1mm long and when studied, the worms are typically grown on petri dishes seeded with bacteria. All 959 somatic cells of the C. Elegan's transparent body are visible with a microscope and the average life span is only 2-3 weeks. The video above was captured using the Lumenera 2-1 microscope camera and a stereo fluorescence microscope.